Do you know what accounts for the largest percentage of household water use in Florida? According to the Suwannee River Water Management District (which includes Gainesville), the answer is landscape irrigation. Irrigation restrictions have been put in place to conserve water, but with our smart watering tips you can keep your lawn looking its best. 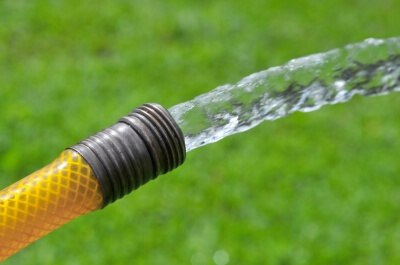 Before you water, make sure you know the mandatory irrigation schedule. No watering between 10 a.m. and 4 p.m.
Do not apply more than 3/4 inch of water to the area being watered. Keep watering to an hour or less for each irrigation area. Sometimes exceptions can be made for new landscaping, hand watering, car washing, pressure washing, or using recycled water, but be sure to contact the Water Conservation Specialist first to make sure the extra water use is allowed. More watering schedule information is available at the Suwannee River Water Management District website. Abiding by water restrictions can be hard on your lawn depending on the amount of sun it gets, the type of grass, and other factors, but with some smart lawncare you can help your yard bounce back into shape. Sharpen mower blades for a clean cut and keep your mower set slightly higher. The taller grass will keep the soil shaded and cool, which in turn means your lawn will be less “thirsty” and require less water. Don’t over water! Besides violating water regulations, over watering can actually stress your grass. Have your lawn aerated to enable easier water and oxygen movement through the soil. Your lawn will also retain more water this way. For knowledgeable residential lawncare in Gainesville, contact Mr. Tree and Lawn Service today and ask about our $30 lawn care special! Our services include mowing, edging, weed control, and more to keep your yard looking great all year long.